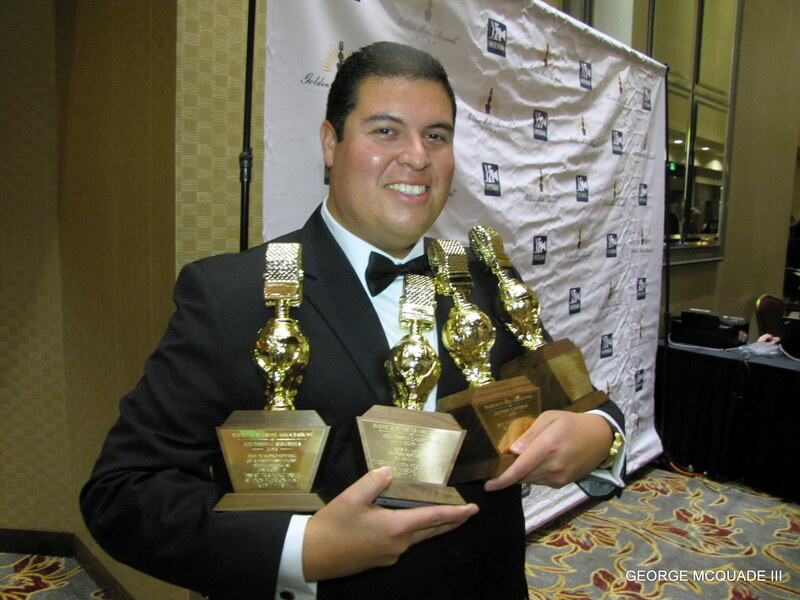 KEYT TV 3’s Videographer Oscar Flores holds just a few of the Golden Mikes his Santa Barbara TV station took home at the RTNA Awards. “Oh my God, Social Media is amazing, you can get to the world in an instant,” said Yvonne Guevara, producer, NBCLA 4 News, who received a Golden Mike for a quarterly special segment on black history. “Each quarter we do a special on each ethnic group,” she said. NBC’s Guevara station also took home several awards including, “Best Newscast 30 minutes or less-NBC 4 News at 11 PM”. If they were not exchanging business cards they were tweeting and posting their favorite photos on social networks at the 65th Annual Golden Mike Awards, Radio TV News Association (RTNA) Saturday (Jan 24, 2015). Social Media used to be an option, but today every industry, including TV and radio news, where news people get some of their breaking news on everything from Twitter, Facebook to Google+ rely on it. The producers at NBCLA will look at all angles to get the story straight. 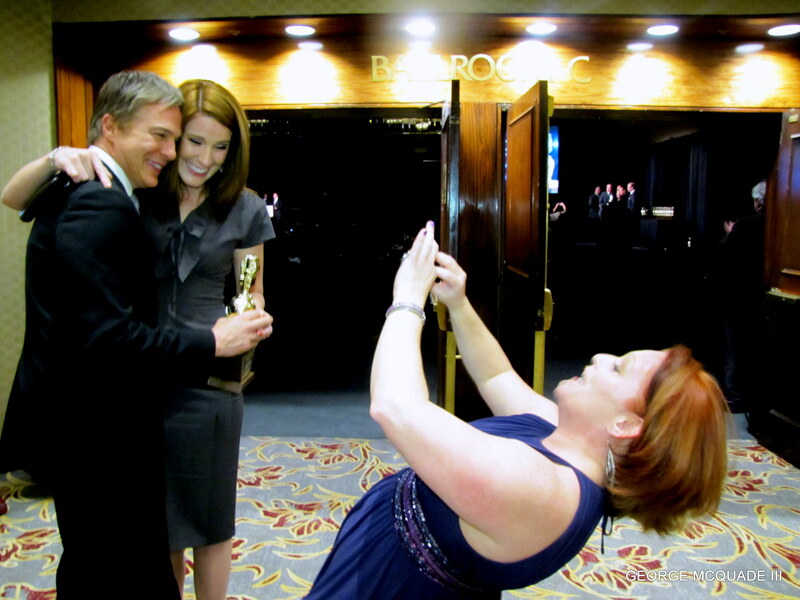 Here they practice getting the right angle on Anchor Bob Kovacik, who is also LA Press Club President. Some 500 radio and TV news professionals packed into the Hilton, Universal City, CA for RTNA Awards dinner. Golden Mikes are considered the Oscars of broadcast journalism. Usually there is a “Designated News week” in October sent over AP and City News Service wires and a “Designated News Day” is announced the day after it occurs, where radio and TV news stations submit their work from that day for “Best Newscasts.” Other entries are submitted for work from Oct 4, 2013 to October 3, 2014. The Golden Mike judges are often selected from out-of-state markets like New York or Chicago. The radio and TV Stations entering in the competition come from Los Angeles, Orange, San Diego, Riverside, San Bernardino, Ventura, Santa Barbara, San Luis Obispo, Fresno, Inyo, Imperial, Kings, Kern and Tulare Counties. The Broadcast Legend Award Honoree went to Maria Elena Sallinas, a highly-rated “Noticiero Univision” co-anchor for the nightly network newscast and co-host of the news magazine program, “Agui y Ahora” (Here and Now). She has been informing millions of viewers for three decades in America, as well as 18 Latin American Countries. She got her start at KMEX-34 in LA in 1981. She now resides in Florida with her two daughters. 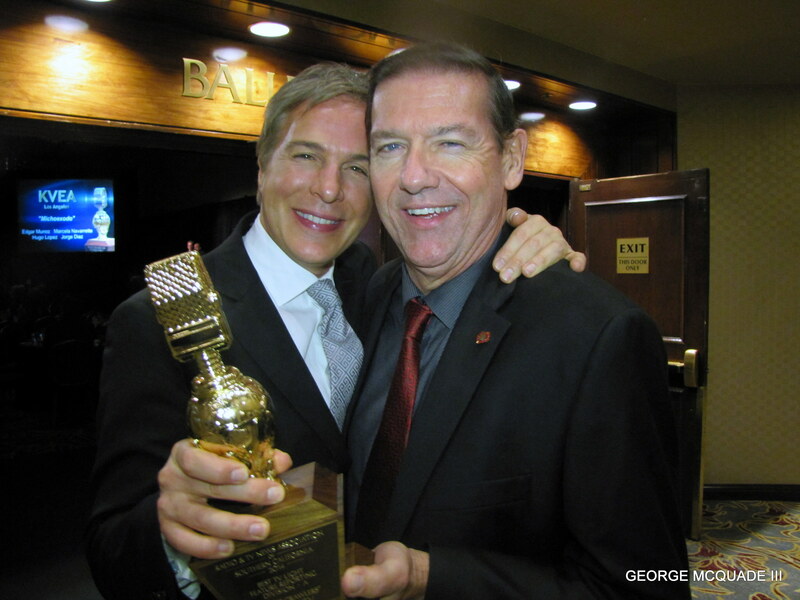 NBCLA award-winning Anchor Bob Kovacik and KNBC TV TLAW alum George McQuade III hold one of several of the peacock’s Golden Mike awards at the RTNA 65th Annual Golden Mike Awards. Long time Television Play-by-Play Announcer Bob Miller received the Life Achievement Award. Miller, who has five decades of broadcasting experience was inducted into the Southern California Sports Broadcast Hall of fame, an organization for which he served as president for five years. Later Miller received a star on the famous Hollywood Boulevard Walk of Fame. Associated Press Court Reporter Linda Deutsch received the Freedom of Information Award and Actress June Lockhart was honored for participation on the RTNA Board. For all of the winners of the Golden Mikes visit: http://www.rtna.org/GoldenMikeAwards/14winners.asp.